Surfing is one of the fastest growing natural sports today and it is lots of fun. It is a unique experience that can be considered both an art form and an athletic pursuit. Nothing can really match the feeling of freedom, when you are paddling for an open ocean swell, catching the wave, jumping to your feet and riding a wave formed of pure ocean energy! Surfing is a lifestyle, a way of life and a great recreational activity that promotes physical fitness, great health, alleviates and relieves stress, and allows you to be in touch with nature! 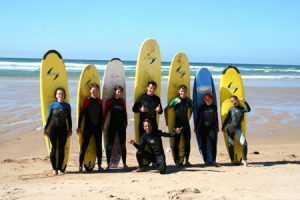 FilSurf School has successfully formed surfers and introduced many people into the world of surfing and exposed them to its benefits of spiritual, emotional and physical well-being. Whatever your goals, surfing is challenging, fun, and a great way to keep fit and meet people. Deciding to learn to surf is guaranteed to open up a whole new way of life for you! We invite you to join us on your surfing adventure, doesn’t matter if you never tried it before and going to learn first steps of surf, or if you are intermediate surfer and want to improve your technique or if you are an advanced surfer and want to prepare for participating in surf competitions or just to have a surf session at the local surf spots with us. Our experienced staff of certified instructors will guide you through all the essential fundamentals needed to get you started on your ocean adventure. Beginners start with the basics of water safety, paddling, stand up and wave selection. Your safety is before everything! 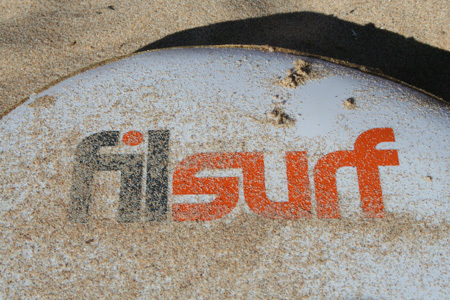 All of our lessons are given on soft surfboards (softboards). The site is determined by our instructors to optimize your safety, fun and learning experience. We teach at your pace and cater to the individuals or groups and their abilities. 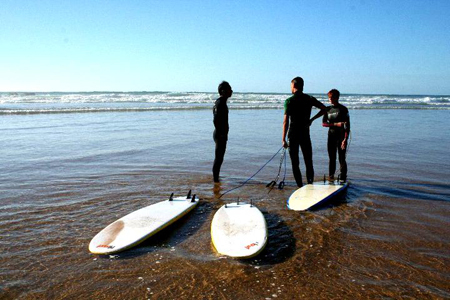 In FilSurf School all the equipment (surfboard, leash, wax and the wetsuit) is adequate for the level of the student and is given by school, which means that you don’t have to invest in your own equipment to learn first steps of the surf. Intermediate surfers can benefit from advanced lessons from our instructors on bottom turns, top turns, cut-backs, barrel riding, reading swell directions, conditions and more! Get some tips for picking the right equipment. It’s very easy to purchase the wrong surfboard. Many people do exactly that. The wrong surfboard for training can make your investment a waste of money. The professional advice of our instructors will help you to pick the right board for your level. For advanced surfers we even offer competitions lessons where you can learn contest strategy! We are opened all year round and offer lessons for all levels and ages (kids starting from 6 years), private or in group. 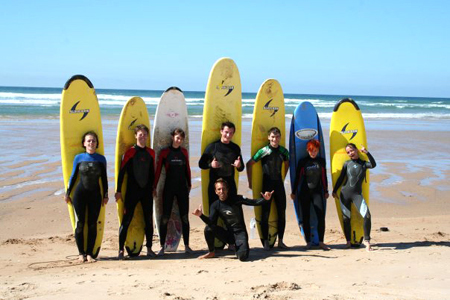 All you need to do is contact us and book your surf course! NOW YOU CAN LEARN TO SURF! Softboards are constructed of an EPS core, with dual stringers for strength, a XEPE sandwich deck, and include soft molded fins for safety. These boards offer increased floatation and durability. Softboards in our school are available in lengths from 6’0 – 9’0. Today’s surf wax is a high tech version of the old candles and paraffin that was originally used on surfboards for traction starting in the 1940’s. Today’s wax is formulated to work in specific temperatures. Wax that has been made for colder water is much softer and stickier than wax made for warm water. When you travel from the colder climes to warmer (or vice-versa), you’ll find that the wax that you have on your board will very likely not perform very well on your board. Leashes help keep you attached to your surfboard. Your leash allows you to fall on a wave, or bail your board when you’re in a difficult position in the impact zone. After you surface, you are then able to recover your board and get back out into the line-up. Without a leash you’re forced to swim and retrieve your board wherever it ends up. Besides that, losing your board can also be dangerous to other swimmers and surfers. The basic formula to grab the right one for you is to make sure that the leash is at least the length of your board. The less experience you have, the longer your leash should be. If you’re riding a 7 foot board and still learning to control it, then make sure your leash is at least a foot longer than your board.